In this edition we're showcasing 3D models by First Team Sports, Huntco Site Furnishings, ID Sculpture, & Infinity Canopy. We've also gathered projects from Miracle Recreation Equipment Company, Inc., Hufcor, Inc., Couturier Iron Craft, Inc., & Eldorado Outdoor. The ALL PRO line of football goalposts are First Team's biggest and best! The All Pro series boasts a massive 6 5/8" diameter steel post for maximum structural stability. 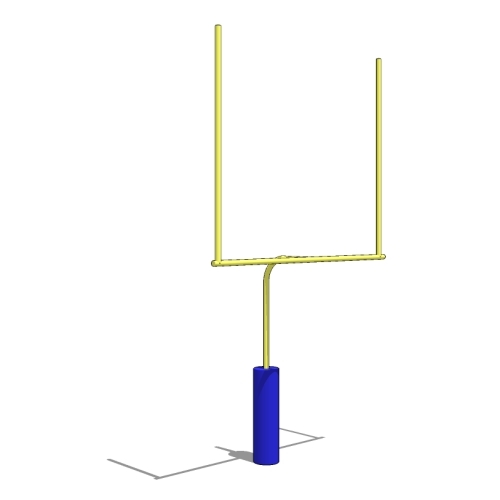 For rust free performance the goalpost has a galvanized undercoating while the 6 5/8" diameter crossbar and 4" diameter uprights are made from rust free aluminum. This aesthetically pleasing, durable picnic table accommodates up to four matching benches and is an outstanding site amenity. Infinity Canopy is the first and only slide on wire canopy system that is ready to install out of the box and because of its unique modular design can fit any space and be modified infinitely to meet your design and shade needs. image © Miracle Recreation Equipment Company, Inc. When the idea for the two playgrounds at Gadsdenboro Park began, the landscape architects for the project, the team at ColeJenest & Stone, sought to tie in the proximity of the water and the surrounding site through nautical themed playgrounds. The plan included a playground designed for ages 2-5, and a separate playground designed for ages 5-12. Stolz explained that Eldorado Stone was also brought into the interior to continue that feel of authenticity and historical accuracy. Stone is used floor to ceiling in the kitchen for a pizza oven, as well as on the fireplace in the Great Room and on an entire wall in the master bedroom. “Using a material like Eldorado Stone allows for the seamless continuation of space, which works very well for us as we design,” says Stolz.